The gaming peripheral market is extremely saturated and unfortunately many of those products are not very high quality. 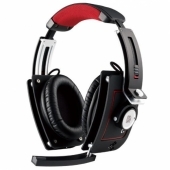 Gaming-oriented headsets would definitely be one of the worst categories as far as cheap knock-offs go. Wimpy plastic construction, uncomfortable design, gaudy colors and LEDs, and poor sound and mic quality are fairly common in the gaming headset arena. However, some companies are dedicated to producing quality gaming products that stand out from the cheap impersonators. Today we are taking a look at Tt eSPORTS’ high-end gaming headset, the Level 10 M. For those who perhaps don’t know already, Tt eSPORTS is the gaming division of Thermaltake and is known for making affordable, high-quality peripherals with the Level 10 brand being their top-tier lineup. With aluminum construction throughout the frame, an adjustable, locking headband, detachable, bi-lateral cable, and folding noise-canceling microphone this gaming headset seems to have a lot of promise. Read on to see how well it actually performs.